While the World Cup is going on — we have quite a little time for football statistics. The amount of time is really limited — it is necessary to learn everything about football within 15 minutes of the half time interval. El Salvador Edition is extremely surprises with the detailed and very entertaining approach to the issue. It’s almost like a Puzzle. 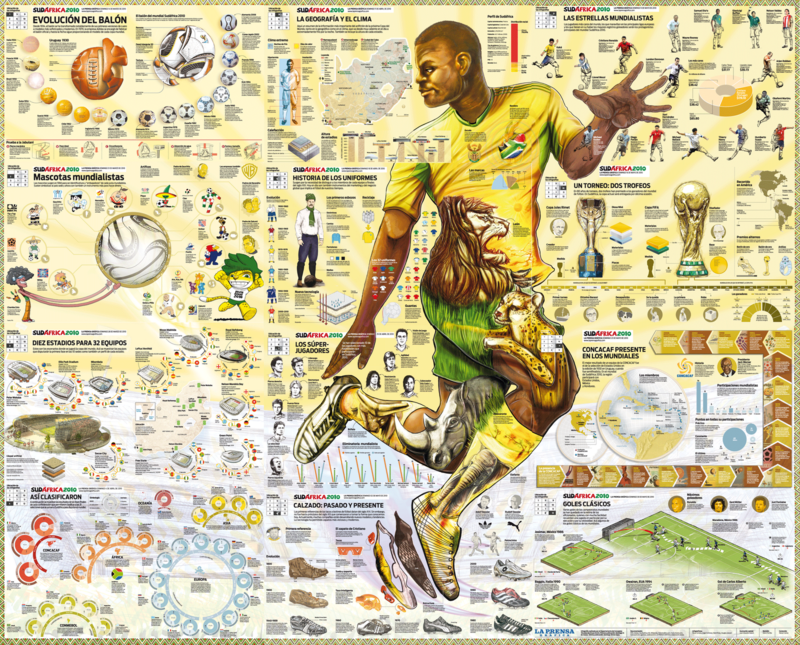 Within three months, every Sunday, the edition would published a separate part of infographic puzzle, based on information related to the FIFA World Cup in South Africa 2010. Topics were different and included the evolution of the ball from championship to championship, most interesting stadiums, goals, geography and climate of South Africa, and other. Readers were getting familiar with the 2010 World Cup by looking at such interesting peace of art. After that, all separate facts were put together, and became a mega-collection of facts. The size of the poster is absolutely mad. You can explore it during more than one break. From what we do not like: too much information is unorganized and has no distinguishing accents — blocks should be added. We would optimized it. 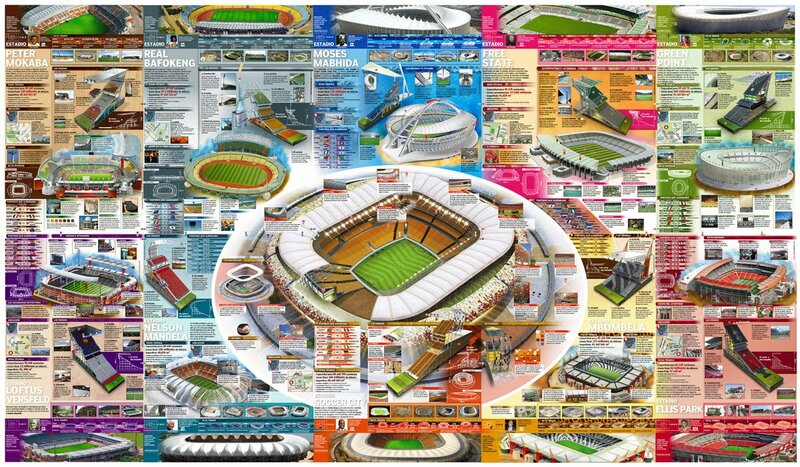 As an addition to the topic — the work of journalistic infographics about the stadiums where matches occurred was made by Italian edition of Record. From the curious — the cut of the stadiums looks very impressive. The idea is good, but realization of it could be more stylish. In our opinion — the cuts of the stadiums should be in a row, so that to look at it will be more interesting — you could compare the stadiums from the outside and from inside.